Hello lovelies, how's your weekend been? Mine's consisted of brunching, op-shopping and working on a new design for my blog. I've also been really enjoying the cooler weather, and making plans to move interstate in May (and worrying how on earth I'm supposed to fit a decent amount of my wardrobe in 1-2 suitcases). 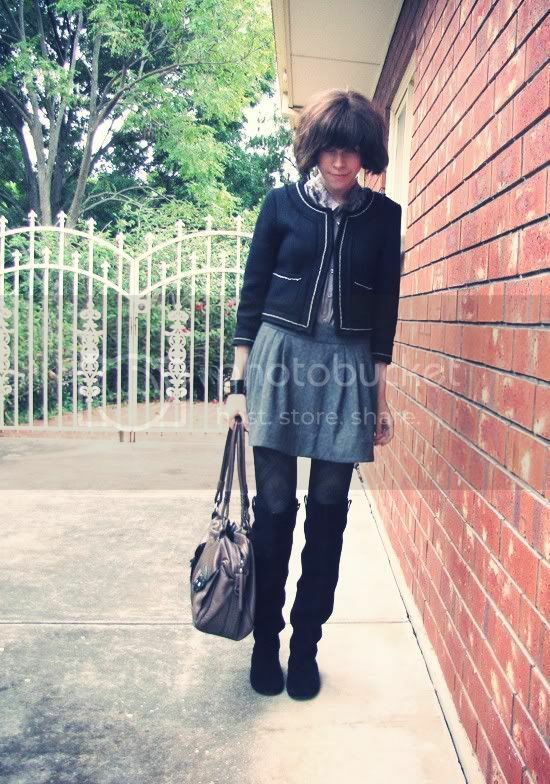 wow,....really cute outfit....love your boot!! I really love the skirt! The colour is beautiful! Where are you moving to? Melbourne? :) Good luck cramming everything into two suitcases, I hate packing. 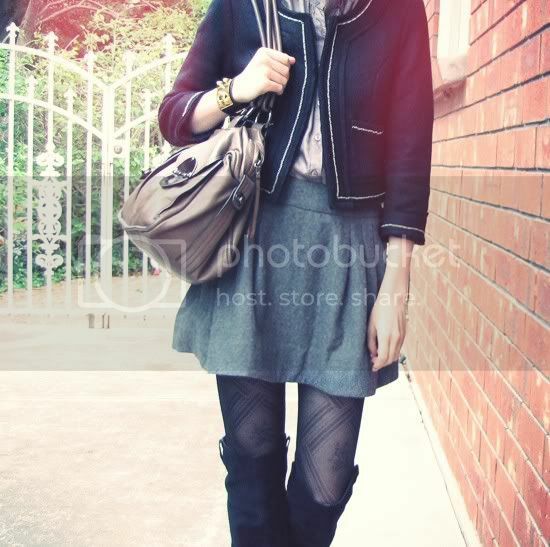 Love the outfit, good for the cooler weather. I especially like the skirt, it is such a simple cut and uses a plain material but it is so...classic and flattering. I really like it. This is a fabulous outfit... you look gorgeous. And (more importantly?) THANK YOU for the ads on the left for the Modcloth bunny jewels! Sooo adorable. LOve the inspired hermes cuff...will u pls share where u got it from?! very cool street style outfit!!!!!!!!! your jacket is tres chic, I also love your boots. Beautiful ensemble. woo I love your cuffe!! Cute bag, great neutral colour... and awesome news, where are you moving to exactly?? love the jacket!! really classic look and beautiful! I am really loving your boots. I have a brown suede pair of over the knees, but now I feel like it may have been a better choice buying the black one. There's just more things I can wear it with. Love the details on the jacket and the boots too! the entire outfit is perfect for the cooler weather. p.s. where are you moving to? love your mimco! wish i could afford one, went to mimco today and came out with a $15 satin alice band ahaha. Your look is absolutely gorgeous! <3 it! Lovely tights! I love the mimco, and those boots are gorgeous! This is so classic and chic! Very pretty. i so much love that outfit!!! Wow, where are you moving? I love this outfit! Classic, with such beautiful long clean lines. I like your tights! I've been trying to stock up on cool tights lately. 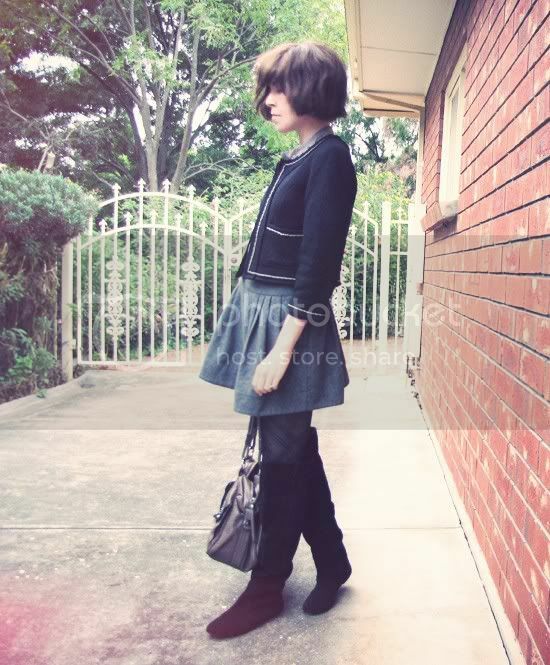 Amazing outfit, love the skirt and the jacket. Looks great :)! omg Im in love with this look!